If you were a big fan of our Limited Release Rioja from a few years back, you’re definitely not going to want to miss this kit! 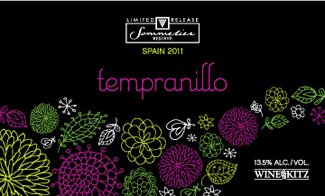 In fact, our Rioja blend included the Tempranillo grape, so you’ll likely find this new varietal strikingly similar! This dark, thick-skinned grape produces deep coloured, medium to full-bodied red wines with good structure and moderate acidity. The bouquet and flavours are reminiscent of cherry, plum, strawberry, spice, tobacco and earth. This wine can be consumed young but will show its best between 6 and 24 months of age, so it’s well worth putting some aside if you can! Like the French Syrah-Grenache (our first Wine Cellar 2011 Limited Release), it will stand up alongside stronger meat dishes, and would be delicious served with grilled red meats, herbed lamb chops, lamb casserole, eggplant moussaka, braised beef short-ribs, meat pies meatloaf, steak and kidney pie, rabbit stew, and bean stews. available only in limited quantities, and by pre-order only. Please call us today at (905) 509 – 6748 or email us at wkpickering@gmail.com to pre-order a kit. Please be sure to let us know whether you’d like a 5-week Sommelier kit or an 8-week Sommelier Reserve kit.